A recent Pew Research survey reveals that reading rates still remain largely unchanged since 2012. 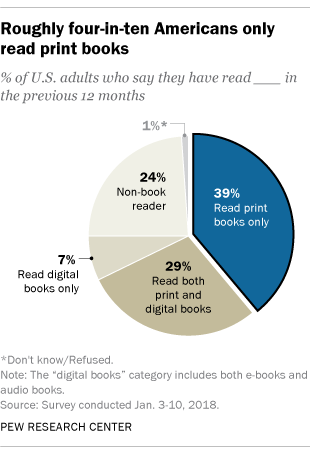 About three-quarters (74%) of Americans read a book in the past 12 months (in any format). Print books remain the most popular format for reading, with 67% of Americans having read a print book in the past year. While reading rates have remained the same for years, audiobook consumption is on the rise. The Pew survey found that just about one in five (18%) Americans listened to an audiobook in 2017. This is an increase of 4% from 2016. Currently, the vast majority of audiobook sales are fiction books. With mystery, thriller, romance, and fantasy/science fiction the most popular audiobook genres. Interestingly, these are also the most popular genres for ebook sales. Nonfiction only accounted for 26.2% of all audiobook sales in 2016. To capture the most sales, the majority of publishers and indie authors currently offer their books in both print and ebook format. As audiobook consumption increases, it may eventually become standard for books to be offered in all three formats: print, ebook, and audiobook. Smashwords, the largest independent publishing ebook platform, is banking on the continued growth of audiobooks sales and the trend toward publishing books (especially fiction books) in all three formats. To help independent authors produce and distribute audiobooks, Smashwords has partnered with Findaway Voices. With this partnership, Smashwords has built audiobook creation right into their publishing workflow. With a single click, Smashwords authors and publishers can instantly deliver an ebook to the Findaway Voices platform to begin the audiobook production process. Audiobooks produced through this partnership can then be distributed through Findaway Voice’s global network of over sales outlets including iTunes, Audible, Scribd, and OverDrive. Two of the biggest tasks in producing an audiobook are choosing the right narrator and the cost of producing an audiobook. With a print book, the emphasis is on the written words. Therefore, in producing a print or ebook, choosing the right font and layout design that matches the message is important. For audiobooks, it’s all about the voice. A narrator’s voice sets the tone for the story. In choosing a narrator, finding the voice pitch and pace that fits the story is critical. Recording an audiobook can be a costly endeavor. Smashwords says that Findaway’s fees are based on the number of hours and minutes of the finished production. Each hour of recorded content comprises roughly 9,000 words, which means a 26,000-word novella might run about three hours and a 100,000-word book would run about 11 hours. Narrators typically charge between $150 and $400 per finished hour. Selling books is all about creating a quality product and marketing it well. Before you jump into producing an audiobook, be sure that you already have steady sales for the print or ebook version of your book. If your book is not already selling well in print, it probably won’t sell well as an audiobook either. Don’t sink money into producing an audiobook when those dollars might be better spent marketing your print or ebook. What Do Books and Music Have in Common? Smashwords, the ebook publishing platform, founder Mark Coker has created an info-graphic called, “The Indie Author Manifesto.” I thought it was worth sharing.